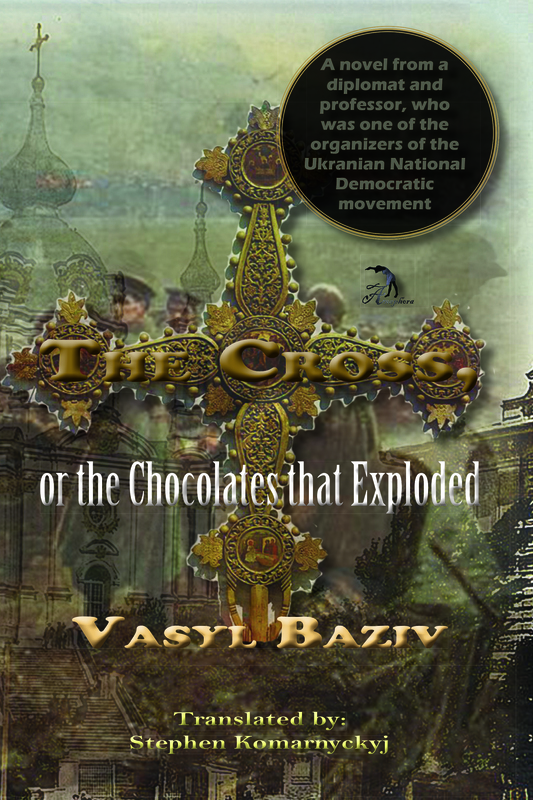 The Cross, or The Chocolates that Exploded: ($20, ISBN: 978-1-937536-53-4, Hardcover ISBN: 978-1-68114-144-2, LCCN: 2013956110, 248pp, 6X9″, Purchase on Amazon): When an ambitious young Communist, Pasha Kharkavyj decides to scale the local church and tear the cross from the roof in a sleepy Ukrainian village he thinks he will make it all the way to the Kremlin . However a tank of sunflower oil left in the wagon he drove to the church explodes leaving dozens of Red Army soldiers dead and Pasha with some explaining to do. Meanwhile his nemesis, Andrij, a youth who combines a flair for football with devout Christianity is wooing Svitlana, the daughter of the local KGB chief who happens to be Pasha’s rival and mentor. This is Romeo and Juliet under the shadow of the hammer and sickle and the onion domes of Eastern Christianity. The outrage perpetrated on the church calls forth a popular uprising. The USSR with Krushchev at its Head wages war against one Ukrainian village, as Moscow throws an entire army into the fray against these new Knights Templar. 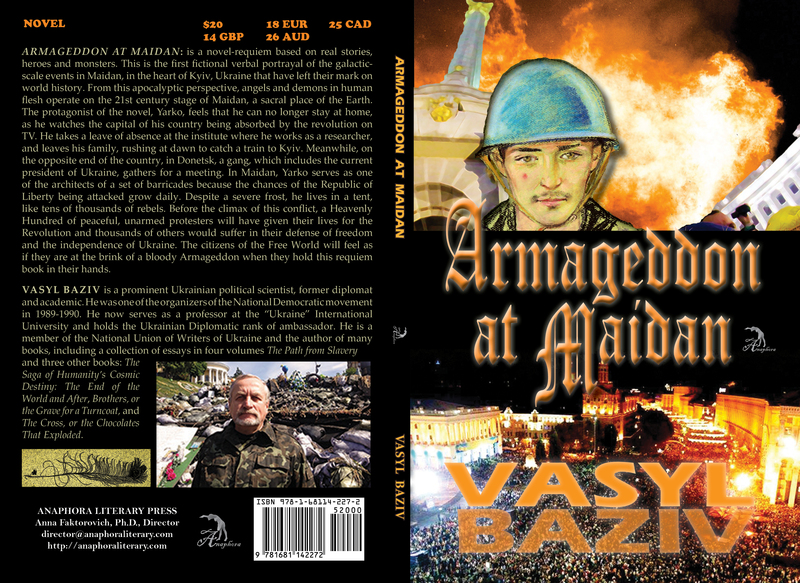 Armageddon at Maidan: ($20, 166pp, 6X9″, Print ISBN-13: 978-1-68114-227-2, EBook ISBN-13: 978-1-68114-228-9, LCCN: 2015959445, 45 color photographs by Valerian Antonovych and Lesia Lutsiv, Edited by Kristen Noy, January 2016; Purchase on Amazon or Barnes & Noble): is a novel-requiem based on real stories, heroes and monsters. This is the first fictional verbal portrayal of the galactic-scale events in Maidan, in the heart of Kyiv, Ukraine that have left their mark on world history. From this apocalyptic perspective, angels and demons in human flesh operate on the 21st century stage of Maidan, a sacral place of the Earth. The protagonist of the novel, Yarko, feels that he can no longer stay at home, as he watches the capital of his country being absorbed by the revolution on TV. He takes a leave of absence at the institute where he works as a researcher, and leaves his family, rushing at dawn to catch a train to Kyiv. Meanwhile, on the opposite end of the country, in Donetsk, a gang, which includes the current president of Ukraine, gathers for a meeting. In Maidan, Yarko serves as one of the architects of a set of barricades because the chances of the Republic of Liberty being attacked grow daily. Despite a severe frost, he lives in a tent, like tens of thousands of rebels. Before the climax of this conflict, a Heavenly Hundred of peaceful, unarmed protesters will have given their lives for the Revolution and thousands of others would suffer in their defense of freedom and the independence of Ukraine. The citizens of the Free World will feel as if they are at the brink of a bloody Armageddon when they hold this requiem book in their hands. Vasyl Baziv is a prominent Ukrainian political scientist, former diplomat and academic. He was one of the organizers of the National Democratic movement in 1989- 1990 and the recent 2014 Ukrainian Revolution. 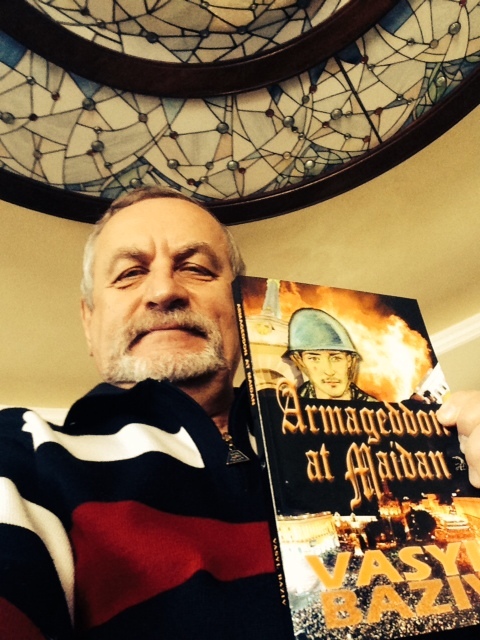 He is a professor at the “Ukraine” International University and holds the Ukrainian Diplomatic rank of ambassador. He is a member of the National Union of Writers of Ukraine and the author of many books, including a collection of essays in four volumes The Path from Slavery, and in addition to his Anaphora novels two other novels: The Saga of Humanity’s Cosmic Destiny: the End of the World and After and Brothers, or the Grave of a Turncoat. Stephen Komarnyckyj is a British Ukrainian writer and linguist who has lived and worked for most of his life in his native Yorkshire, while maintaining strong links with Ukraine. His literary translations and poems have appeared in Poetry Salzburg Review, Vsesvit magazine (Ukraine’s most influential literary journal), Fjords Arts and Literary Review, The North, The Echo Room and Modern Poetry in Translation. His book of selected translations from the Ukrainian poet Pavlo Tychyna was published by Poetry Salzburg in 2011. He was also the featured poet in issue 163 of Envoi. The first collection of his poetry is due to be published in 2014. Susie Speight is an experienced English language teacher, who has worked in education since graduating in 1997. Her work has included establishing and managing community education projects and teaching English as a foreign language, both in the UK and overseas. She is an experienced proof reader and editor, specializing in literature and educational texts. She is currently working on her first novel. Sergii Kolomiiets is a self-employed translator working with English, Ukrainian and Russian, with over seven years of full-time experience.